I love Christmas music. I’m not scared to admit the first CD I ever bought was Hanson’s Snowed In back in 1997. I could probably sing you the majority of Merry Christmas Baby word for word. Carols give me goosebumps – especially ones that highlight the incredible thing it is that Jesus, God’s Son was born into this sinful world. I’ve got to say though, that Citizens’ new Christmas EP, Repeat the Sounding Joy, is one of the best Christmas releases I’ve ever heard, and one of the best releases overall from this year. It’s joyful, it’s funky, and it makes you dance. Really? On a Christmas record? You bet. Zach Bolen and his band from Mars Hill Church U-District have fashioned five hymns with new arrangements, whilst keeping the original melodies so we all don’t get confused as we sing along. And best of all, the words that speak the truth of the gospel are left plain to see. The EP opens with Joy to the World, complete with joyous gang vocals and Zach screaming ‘Let heaven and nature sing!’. Hark! The Herald Angels Sing opens with a brass line fit for a 70s cop show (in a good way) but the song is so upbeat, it believably rejoices as the angels do. The highlight of the EP for me is track four: Come, O Come Emmanuel. It’s a hymn so old that sits in tattered hymn books in church pews, but Citizens have breathed new life into it by making it a party. It builds and builds and at the end is left to joyful backing singers proclaiming ‘Rejoice! Rejoice! Emmanuel has come to thee!’ while Bolen screams parts of Isaiah prophesying Jesus’ character. It’s a beautiful moment and seriously raises the bar for how joyful Christmas music should be. I got to speak to Zach Bolen at length about the Christmas release, and the full interview will be posted on Reel Gospel as a special Christmas feature next month. But as a taster, here is what Zach said about why they named the EP Repeat the Sounding Joy. “…Right out of Joy to the World: ‘Repeat the Sounding Joy’ was thinking about the fact that when you think about that statement there’s actually an auditory element: the actual sound of God’s people coming together joyfully. Not just God’s people – all of creation – joyfully proclaiming the King of Kings is here. The Lord of Lords has come from his throne and came to save us. Buy this EP. The whole thing is a party and Citizens bring the groove; but most importantly Jesus – the reason for Christmas – is proclaimed. A full transcript of this interview about the EP will be posted on Reel Gospel as part of our Christmas music interview series in December. Like us on Facebook or follow us on Twitter to be notified of when it will be posted. In the meantime, you can catch up on our Citizens album chat from earlier in the year, here. 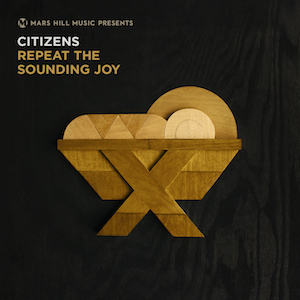 Citizens’ Repeat the Sounding Joy is released Monday 25th November and can be purchased from the Mars Hill Music store, or on iTunes. Posted in MusicTagged Christmas, Christmas music, Citizens, Come O Come Emmanuel, God, Hark! The Herald Angels Sing, Jesus, Joy to the World, Mars Hill Church, Mars Hill Music, Party, Repeat the Sounding Joy, Zach BolenBookmark the permalink.